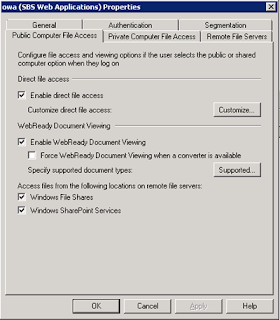 One of the nice features of Exchange Server 2007 that helps eliminates those irksome VPN clients (and the associated configuration pain) is the WSS and Windows File Share Integration. This facility gives you read-only access to WSS sites and file servers sitting inside your network. Very handy if you need a file when you're on the road and no-one is in the office to e-mail it to you, or you can't use Remote Web Workplace to connect to an internal PC. By default, Exchange Server 2007 on SBS 2008 is configured to allow access to files on remote file servers, but additional configuration is needed. Specifically, the names of the servers need to be added. Fire up the Exchange Management Console, expand Server Configuration and select Client Access. Right-click on "owa (SBS Web Applications)" and select Properties. 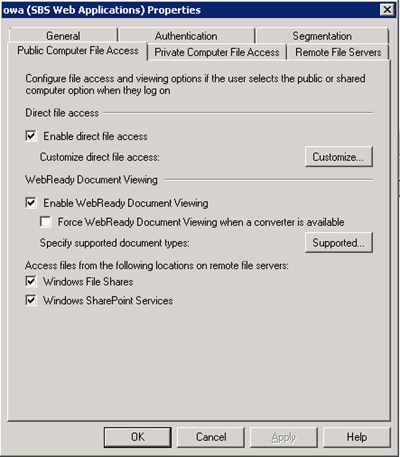 Click on the Remote File Servers tab and click on Public Computer File Access and/or Private Computer File Access and confirm that file access is enabled accordingly. 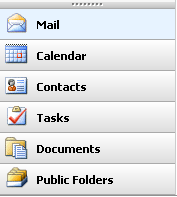 The settings in these tabs relates to the features available depending on whether you select Private Computer or Public Computer when you log in to Outlook Web Access. Take this into consideration when deciding what you want to enable/disable. Enter the server name you want to allow access, click Add, then click OK. If you want to allow access to the SBS server, enter its name here. Please note that all shares will be available to Outlook Web Access, depending on the user's access to those shares. Similarly you can click on the Configure... button in the Remote File Servers tab and add "<company>.local" to enable access any WSS applications you have additional to the companyweb application. Replace <company>.local with the DNS suffix used by your SBS 2008 network. Test your configuration by logging into Outlook Web Access, selecting the appropriate security profile. Now click on the Documents shortcut (you may need to click on the >> link under the OWA graphic to expand the Navigation Pane). 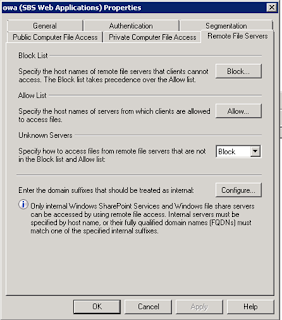 Type in the UNC path to the file share (e.g. \\SERVER\Shared) and click Open. 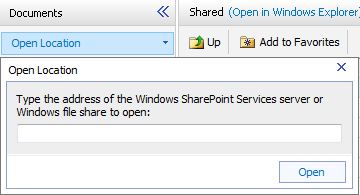 Outlook Web Access will then display the shared folder contents. Click on "Add to Favorites" if you want to add the shared folder to your Documents Favourites list for quicker access on return visits. Again, please note that this is read-only access - you will need to save any changes you make locally, then copy the changed file when you get back to the office. If you need read/write access without bothering with a VPN client then using companyweb via Remote Web Workplace is the preferred option. After spending a lot of time recently on Blogs etc on another issue... what a joy to find a well written, clear, accurate and full article! Thank you!